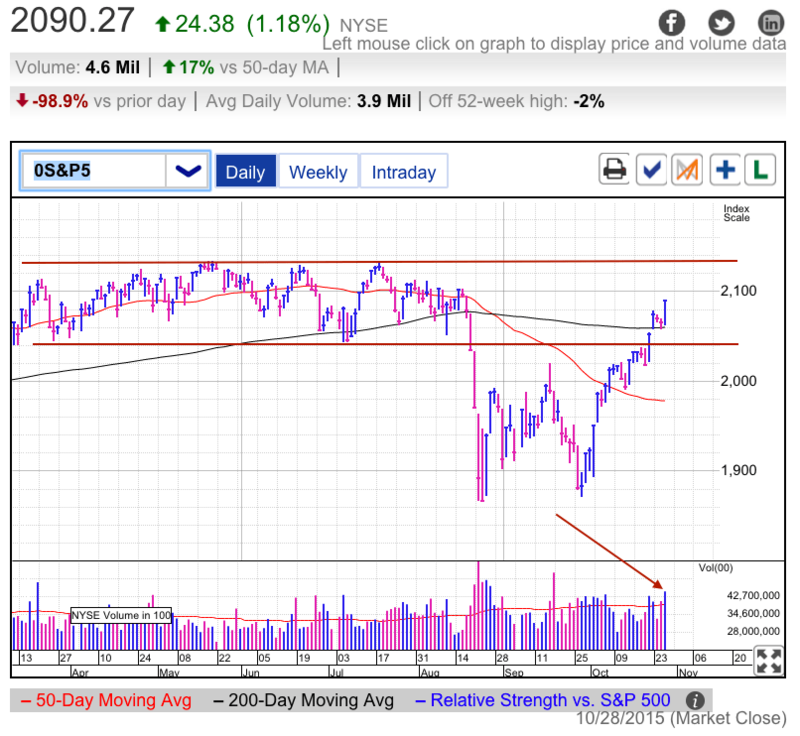 The S&P500 continues to defy the skeptics as it surged to 2,090 by Wednesday’s close. October’s breathtaking rebound leaves us 2% from all-time highs, something unimaginable only a few weeks ago. I was a member of the buy-the-dip camp, but even this recovery caught me by surprise. Wednesday’s headline event was the Fed’s policy statement that held interest rates at current levels, but left the door wide open for rate hike in December. The market initially sold off on the prospect of near-term tightening, but it quickly found its footing and rallied decisively into the close. Volume registered at the highest levels since the last Fed meeting. It appears the market is slowing moving back to a more traditional mindset where good news is good and bad news is bad. For several years we went through a period where the market cheered bad news because that meant a continuation of easy money. But we’ve seen the opposite reaction in recent months. September’s selloff followed the Fed’s no-hike decision, while this afternoon’s rally came after strong hints of an imminent rate hike. This suggests stock prices are no longer dependent on the Fed’s generosity. Instead traders are responding more appropriately to September’s global growth concerns and this month’s relief that the situation turned out less bad than initially feared. While it is nice to find ourselves in the green for the year, we must be cognizant of where we came from. Two-hundred points over a few week period is a stunning move, but everyone knows the market moves in waves. Without a doubt these two-giant leaps forward will be followed by a step-back at some point. Will we run out of buyers at 2,100? 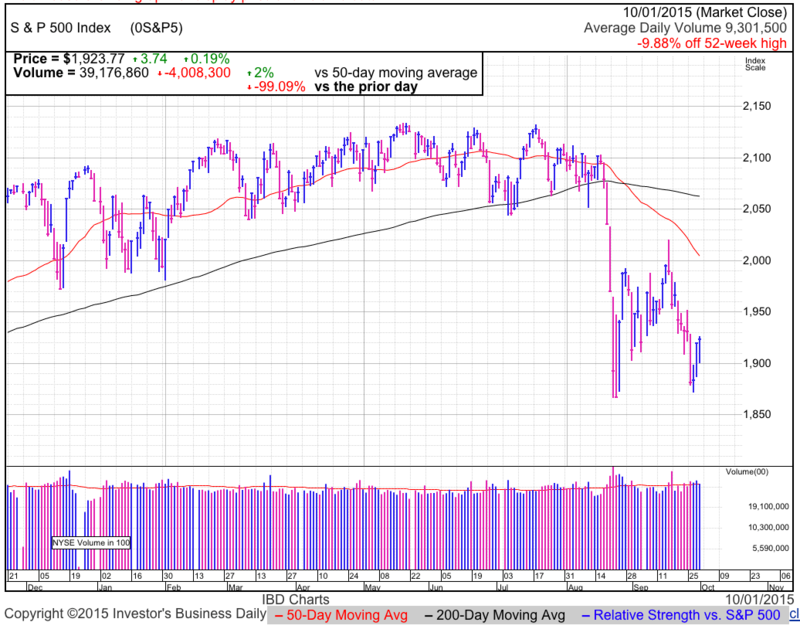 Are traders ready to chase the market above all-time highs? Lets not forget that the reasons for August’s plunge are still as real and present as they were two months ago. It won’t take much to stoke those fears again. While I am happy to see the market recover from an emotional and irrational selloff, it feels like this buying frenzy is just as questionable. Like always, long-term holders can continue holding. Those with cash should resist the temptation to chase after such a huge move. While momentum is clearly higher and will likely challenge 2,100 resistance, we know a step-back is coming. The patient trader will wait for the inevitable vacuum of demand that follows every panicked buying frenzy. What’s a good trade worth to you? How about avoiding a loss? For less than the cost of a daily coffee, have analysis like this delivered to your inbox every day during market hours. As an added bonus, I share personal trades with subscribers in real-time. 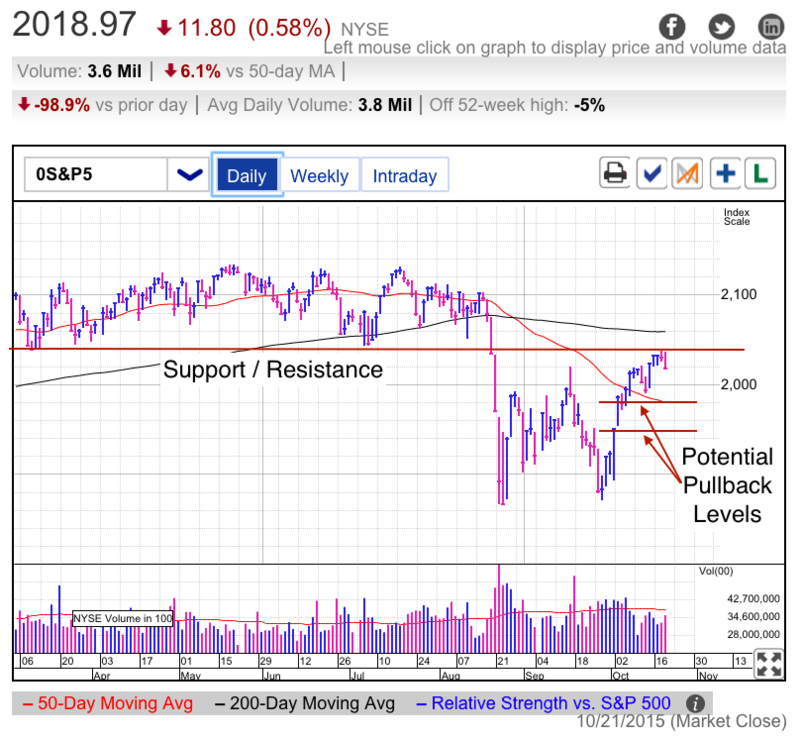 The S&P500 slipped under 2,020 support Wednesday, reversing from early gains. Volume was below average, telling us that not a lot of owners were worried by this 0.6% loss. That can be a good or bad thing depending on how you choose to read it. The bullish interpretation is confident owners create a solid foundation when their stubborn resolve keeps supply tight. However bears will remind us that capitulation reversals happens on high volume. The last couple of days of light volume means we haven’t shaken the tree very hard. A fair number of weak owners are still hanging on and could easily turn into nervous sellers if we slip any further. This was only the fifth downday since late September. Over that breathtaking stretch, we surged nearly 150-points and recovered more than half of August’s selloff. Seeing a little red on Tuesday and Wednesday is not unexpected or a bad thing. Everyone knows healthy markets take periodic steps back and is most likely what this is. The only questions are when, how long, and how much. Technicians often spot 38% and 62% retracements of the prior move (Fibonacci). Applied to our 150-point move, that would be a 57 or 93 point pullback. Currently we’re only 20-points from the recent highs, meaning there is plenty of additional room to fall. Unfortunately the 38% and 62% values are only valid from the top of the move and we won’t know until after the pullback where the actual top was. While this method cannot tell us when the market will peak, it gives us an idea of the magnitude of pullback we should expect. A 20-point dip doesn’t come close, so either we haven’t finished sliding, or 2,040 isn’t the top. In a few days we will have our answer when we keep slipping, or bounce and continue higher. We are quickly moving into earnings season and that is taking the focus away from Asian and European markets. While there isn’t a lot to get excited about by our sluggish earnings, at least we are no longer being held hostage by overseas stock markets. The challenge with interpreting earnings is anticipating the market’s reaction. It was fairly comical when Wednesday morning’s headlines told us stocks were up on encouraging earnings, while later in the afternoon the same financial journalists blamed the selloff on disappointing earnings. With so many companies reporting, traders can find plenty of evidence to prove whatever bias they harbor. If they are looking for an excuse to sell, they will find it. If they are looking for a reason to buy, there will be plenty of justifications. This means the mood of the market is far more important than the actual results. After such a strong run, it seems like those with cash are taking a half-full view of the situation. 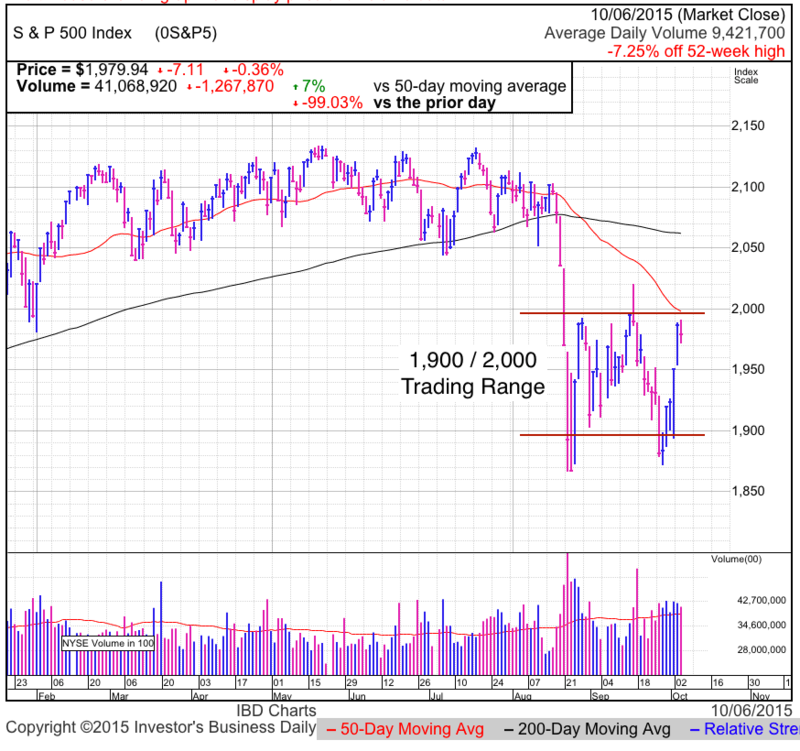 The last few days we’ve run into resistance every time the market pushed up against 2,040. This shouldn’t be a surprise since this provided support through most of 2015. What is support often turns into resistance that appears to be the case here. Real or self-fulfilling, those with cash don’t want to chase stocks higher than 2,040 and that lack of demand is keeping a lid on prices. What does this all mean? If earnings come in as expected, then a pullback to the 50dma would be healthy and represent a good buying opportunity. On the other hand, if key earnings start missing badly, then the global selloff will flare up and we could easily undercut recent lows. Finally, if we blow past 2,040 resistance, there isn’t a reason to chase the breakout since we know a 60-point pullback coming. Let the market peak and then come back to you. Should We Believe in this Rebound? The S&P500 slipped modestly Tuesday, but there is nothing unusual about pausing and catching our breath after a two-day, 90-point rebound. Volume was near average, showing few were concerned about this sideways churn. Friday morning U.S. stocks were punished when employment missed expectations, but moments after that weak open prices launched an explosive rally that pushed us back to the upper end of the trading range. At this point it is hard to say if traders bought the dip because bad news is still good, if the bad news was less bad than feared, or if people were following the herd and buying because everyone else was buying. The difference is critical because knowing who was buying and why they were buying tells us how sustainable this rebound is. Chasing and short-squeezing are two of the least sustainable forms buying because these are a short-lived phenomena. These buyers don’t believe in what they are buying, they are simply reacting to what everyone else is doing. And as soon as the wind shifts, so will their trading. On the other hand, buyers who were excited about bad news delaying the Fed’s rate-hike are also misguided. We are deep into the region of diminishing returns where additional easy money will have little impact on prices. We need real economic gains to fuel the next rally leg. Delaying a 0.25% rate increase by a few weeks isn’t going to help corporate earnings or the economy. We already saw this realization when the Fed’s “no hike” decision lead to the most recent 100-point selloff. The last possibility is less bad than feared. This 10% correction was driven by fear of a global slowdown taking us with it. The logic assumes a strong dollar and weak overseas demand would crush our export economy. But so far the data isn’t supporting this correlation. Europe and Asia have been slowing for quite a while, but have yet to make a serious dent in our recovery. Without a doubt these are headwinds we have to fight against, but they haven’t been substantial enough to reverse our growth or hiring gains. The latest data points continue showing growth and hiring, meaning maybe things are not as bad as feared. The first two reasons to buy this rebound are deeply flawed, but the last one is the real deal. While it is hard to get in traders’ heads, how the market acts in coming days will tell us who bought and why they bought. Chasing, short-squeezing, and buying bad news are all flawed trading decisions and if this bounce was built on that type of foundation, it will crumble within days. On the other hand, if traders are growing increasingly confident in our economy as they realize the fallout from a global slowing isn’t as bad as they initially feared, they will start buying with increasing conviction. That will show up in stable, supportive prices near 2,000. The most constructive behavior we could see over the next couple of weeks is overseas selloffs that are met with a shrug when they reach our shores. No longer reacting to foreign weakness tells us this story is priced in and we can stop worrying about it. That will be our sign to jump in and ride the year-end rally back toward recent highs. But if we cannot hold recent gains, then we’re not ready yet and undercutting August’s lows is a very real possibility. But not to fret, this is just another opportunity to buy stocks at cheaper prices as we form a double-bottom. Stocks closed modestly higher, but it was a respectable performance since we were down 20-points midday. Volume was average as most traders await Friday’s monthly employment report before making their next move. The tail continues wagging the dog as our early stumble was driven by German weakness. While U.S. and German markets often trade in parallel, it’s because Germany’s export economy is heavily dependent on U.S. consumers. As goes the U.S., so goes Germany. But the opposite is not true. Germany consumes a nominal percent of U.S. output, so a slowdown in the German economy is barely a speed bump for us. That is why it is not appropriate for U.S. equities to be held hostage by German and Chinese markets. These countries need us, but we don’t need them. While a global slowdown is not helpful, it is not fatal to our economic recovery. Without a doubt our markets will break this nonsensical link when traders realize our fortunes are not as tightly tied to the rest of the world as they currently fear. The upcoming employment and earnings season will show just how marginal of a role the slowing global growth story impacts us. The last few days has given both bulls and bears something to crow about. Today was the third day in a row we rebounded from midday selloffs and finished higher. If stocks were teetering on the edge, these early plunges were more than enough to push us into the abyss. The fact we resisted such an easy excuse to breakdown tells us the market is not as fragile as it feels. However, the daily chart looks horrible and we are clearly in the middle of near- and medium-term downturns. Guilty until proven innocent is the name of the game and until we see real buying push us above 2,000, every bounce should be met with suspicion. The most interesting setup would be a sharp selloff that shoves us under August’s 1,860 lows on historic volume. But rather than devolve into another steep leg lower, supply dries up and we bounce. This would be the last hopeful holdouts capitulating and the formation of a solid double-bottom reversal pattern. While the market rarely gives us what we want, we can always hope for a great buying opportunity like this. Until we breakout, breakdown, or form a compelling double-bottom, expect prices to remain stuck in the 1,900ish / 2,000ish trading range. What’s a good trade worth to you? How about avoiding a loss? For less than the cost of a daily coffee, have analysis like this delivered to your inbox every day during market hours. As an added bonus, I share personal trades with subscribers in real-time. Start your free trial today!